Western Railways recently started intensive drive for creating awareness against trespassing it urges the public to value their lives and not to put it on stake by crossing the tracks unlawfully. It also urges them to use foot over bridges and subways. 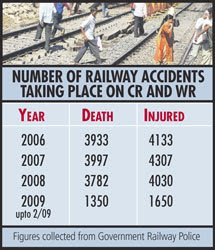 Loss of precious human lives on tracks due to trespassing has always been a major concern for the Western Railway. It is also worth mentioning that trespassing is not only dangerous and fatal but also illegal and a punishable offence.According to the Indian Railways Act, 1989, if any person enters upon or into any part of a railway without lawful authority, or having lawfully entered upon or into such part misuses such property or refuses to leave, he shall be punishable with imprisonment for a term which may extend upto six months, or with fine which may extend upto Rs 1,000, or with both.Now Railway police come heavily on the trespassers and two persons were sent to jail for seven days by the railway court on Saturday for trespassing at Vasai road under section 147 of Indian Railway Act while two persons were fined Rs. 500/- .Two persons were fined Rs.500/- each along with the punishment till the court was resolved for trespassing at Bhayander on Friday while on Saturday two persons were again fined Rs.500/-, one person fined for Rs.200/- and another Rs 100/- for trespassing.